INTERNAL SECURITY COVER AND DRAUGHT CONTROLLER FOR LETTERBOXES. Made from high grade, powder coated aluminium, “Dri-Box” is easily affixed with screws and gives the immediate comfort of security. 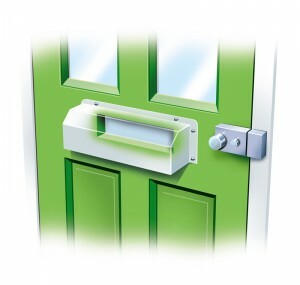 No more worries about illegal access via the letterbox – No more draughts – whilst still permitting mail to be delivered. Variations are available on request. For more details please click the pdf below, alternatively contact Stuart or Phil on 01942 715678, who will be able to answer any questions you may have. This item and many more are available in our online shop, see the categories to the right, click the link below or click ‘Shop’ at the top of the web site.